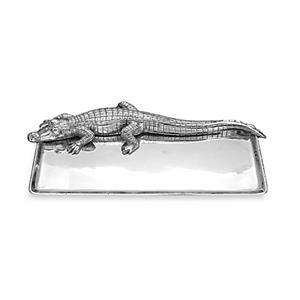 Offer great flexibility to your entertaining needs with this attractive 9x20 Alligator Tray from Arthur Court. A detailed alligator heads the piece, stretching its long body and tail the length of the dish. The scaly texture of its skin mixes well with the smooth, gleaming finish on the rest of the handmade, aluminum tray. Size: Length: 20.0" / Width: 9.0"